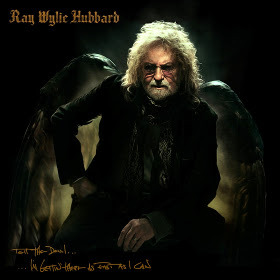 Ray Wylie returns with another heavy dose of what he's damn good for. You know the deal: gritty Texas blues, God, the Devil, philosophy, the particulars of being a musician, and lots of stories. "God Looked Around" is a retelling of the Garden of Eden story through Hubbard's trademark filter of wit and candor. The lead single and title track is as close as you'll get to commercial-sounding in RWH's world - it brings together our fearless leader with Eric Church and Lucinda Williams providing support for this world-weary anthem about life, music, and pondering the long, strange trip. "Old Wolf" is a stomping snapshot of a dive bar and its regulars, with Ray giving us his best Warren Zevon howl. My only complaint here is that there's a sameness of sound in general, and across the first half of the album in particular. A little variance in tempo and melody could have brought the record up a notch or two in my book. Still, anything from Ray is hardly unwelcome and he's consistently consistent - a legend by any standard - and Tell the Devil I'm Gettin' There As Fast As I Can gives you exactly what you need, no more, no less. The album is available everywhere you might imagine. Tell The Devil I'm Gettin' There As Fast As I Can by Ray Wylie Hubbard from Ray Wylie Hubbard on Vimeo.